Easing of pregnancy and related problems: morning sickness, miscarriage, labor pains, production and quality of mother's milk. Rich nutritional value for the mother and baby during pregnancy, labor/delivery and breast feeding. Dizziness, headache, heavy-headedness; shoulder pain, lower back pain, weak knees and/or legs, tinnitus. Menstrual problems, cramps, irregular flow, pre-menstrual syndrome. 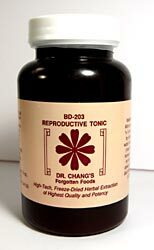 Rebuilding of damaged tissues of uterus after abortion, miscarriage, etc. Depression, nervousness due to hormone imbalance. Acne stemming from a hormonal problem. Increase of blood circulation and immunity. Adjusting of blood pressure (high or low). Tipped or poorly positioned uterus. Bladder, urethra infections, yeast infections, kidney infections. Chronic infections (men and women). Tense shoulders and neck in young women. Cold hands and feet in young women.